Anneal the area of the pipe that is to be formed. with a raising bar, as shown in view A of figure 16-40.
can be bumped out with a bumping ball. interfere with the flow of fluid in the system. necessary to anneal the pipe end. pipe will fit into the cup, flare the end of the cup slightly. Then anneal and clean the cupped end of the pipe. joint surface to be brazed. (fig. 16-39). 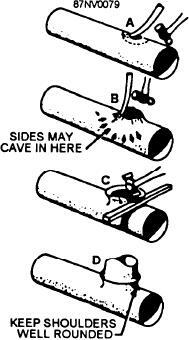 Then braze the joint. sections may strain joints to the point of leakage. main line pipe at the center of the intersection. should refer to the manufacturer's technical manual. direction of flow, and other information. particular valve is suited for installation in the system. with enough headroom to allow for full operation. Figure 16-40.--Steps in making a cup branch.